Registration for the Energy Exchange is open to government employees (federal, state, city and local), as well as government contractors and private industry. The Energy Exchange focuses on ways to design, operate and integrate federal and private sector facilities, fleets, and resources, in the most efficient, sustainable, and cost-effective manner. This professional development opportunity includes numerous activities to help you achieve your long and short-term career goals. Earn IACET learning credits for the vast majority of training sessions. Discover emerging and advanced technologies. Gain in-depth insight on portfolio planning and effective implementation for energy resilience. Master smart building design and operation. Understand barriers and opportunities for energy and water efficiency and employing renewable energy. Explore the Energy Exchange Trade Show. Network and collaborate with 2,500+ peers and stakeholders. Visit the FEMP Hub and get your questions answered. Attend the FEDS Spotlight event. Online Registration is open until the beginning of the event. Online registration and payment will not only save you money and time but will also create a smoother process for your arrival. Select the appropriate registration type below. 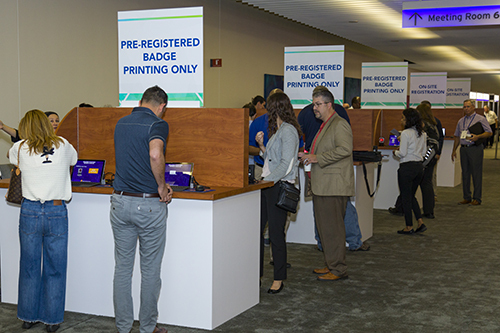 You will need to present a DOE or DOE National Lab issued government ID to register and pick up your badge. Please note that travel priority to attend this year’s event will be given to DOE and National Laboratory attendees who have been invited to be speakers, moderators or have been identified as requiring critical training. This may result in a request to individuals who have registered but not received an invitation to alter their registration or travel reservations. The Federal Energy Management Program (FEMP) and the DOE Sustainability Performance Office (SPO) will continually monitor the registration lists to ensure access to the event for all DOE program offices and that travel quotas are not exceeded. Additional details will be released to DOE staff on attending Energy Exchange. If you are interested in attending but unsure if or when you should register, please contact FEMP_Training@EE.DOE.Gov for more information. To register as a Public Sector attendee, you must have a .gov, .mil, .edu, .dpu or other public sector email address. You will need to present a government or military ID to pick up your badge. Government contractors are not permitted to register at the Public Sector rate. Registration includes access to the training sessions and trade show. Government Contractor or Private Industry registration is for onsite and offsite government contractors and those who work for private industry. You will need to present a photo ID to pick up your badge. Registration includes access to the training sessions and trade show. Once the event begins, on-site registration and pre-registered badge printing hours will be as follows. Sunday, August 18th 12 p.m. – 5 p.m.
Monday, August 19th 7 a.m. – 5 p.m.
Tuesday, August 20th 7 a.m. – 5 p.m.
Wednesday, August 21st 7 a.m. – 5 p.m.
Thursday, August 22nd 8 a.m. – 12 p.m.